If you’ve ever traveled to Santa Fe, then you’ve seen at least a little of what makes this city such a unique and wonderful place — from the abundant art galleries and adobe style architecture of the homes and businesses downtown to the dramatic beauty of the Sangre de Cristo and Jemez Mountains and red rock formations that surround the city on all sides. These dramatic landscapes and its striking architectural treasures are a big part of the appeal for the Santa Fe Thunder Half Marathon, run just as summer is giving way to fall here among the mountains of northern New Mexico, just a short drive from the state’s popular ski resorts like Taos to the north. The race follows a point-to-point course, exactly as its name suggests, from the city of Santa Fe all the way to the area known as the Pojoaque Valley, where runners will finish the race at the Buffalo Thunder Resort & Casino, whose buildings and interiors mirror the styles you see in nearby Santa Fe and which also features a 36-hole golf course and spa in addition to its gambling casino. Runners start the race near the site of Santa Fe’s historic Fort Marcy, a onetime military reservation whose history dates all the way back to the 1840s and today serves as the site of Fort Marcy Park, with a baseball field, soccer field and outdoor swimming pool facility. 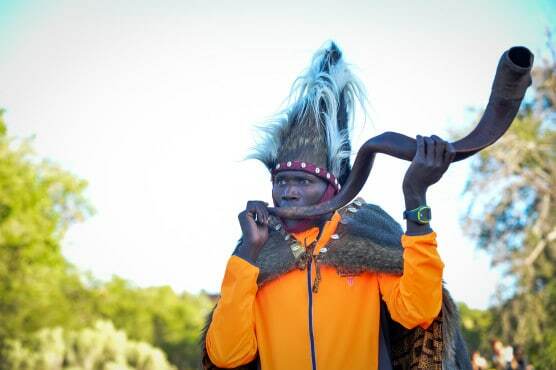 From there, runners head out onto the Old Taos Highway and head north, running roughly parallel to Highway 285 as they make their way along a gradual uphill for the first couple of miles. After runners pass the mile 2 marker, the course then begins a long and very gradual descent that ends only at the finish line in Buffalo Thunder, during which the race route will shed about 1,300 feet in elevation from the peak at the 2nd mile to the finish line. The remaining miles unfold along a long downhill stretch in the shadow of the Santa Fe National Forest to the east, taking runners past the Tesuque Village Market as well as Camel Rock, the famed rock formation that looks exactly like, well, a camel! The final few miles of the race bring runners into the Pojoaque Valley toward the casino and resort area, which lie just off the highway along the Buffalo Thunder Trail. Located at the foot of the Sangre de Cristo Mountains in central northern New Mexico, just over 60 miles northeast of Albuquerque, Santa Fe typically sees mild to moderately warm and usually sunny weather in September, which has brought record temperatures here as low as 23°F (in 2000) and as high as 94°F (in 1984). On race day (Sept. 15), the average low is 46ºF and the average high is 77ºF. 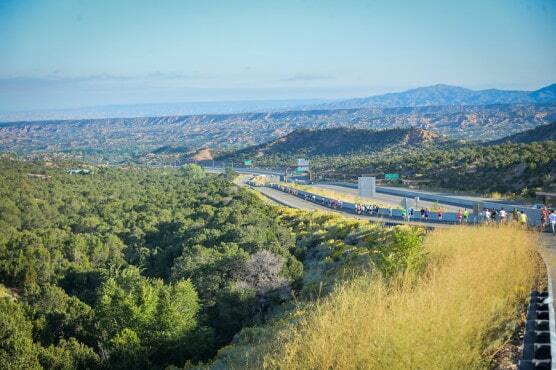 See the race route map for the Santa Fe Thunder Half Marathon here. 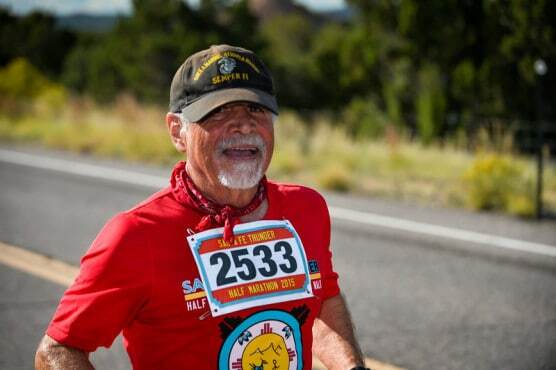 To reserve your spot in the 2019 running of the Santa Fe Thunder Half Marathon, 5K or 1-Mile race, register online at Active.com here. 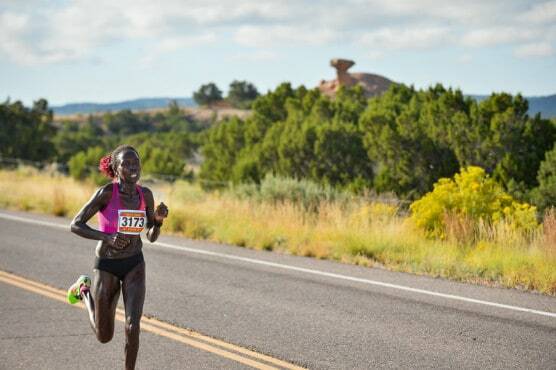 Ever run in the Santa Fe Thunder Half Marathon? Share your impressions here, or post your review in the Comments below. Are there buses to get runners from finish back to Santa Fe? Since it’s a point to point race how does one go about getting back to their vehicle in Santa Fe? If you can contact me regarding sponsorship for this event. I am the Race Director and would be happy to talk with you about potential sponsorship. Please email me. 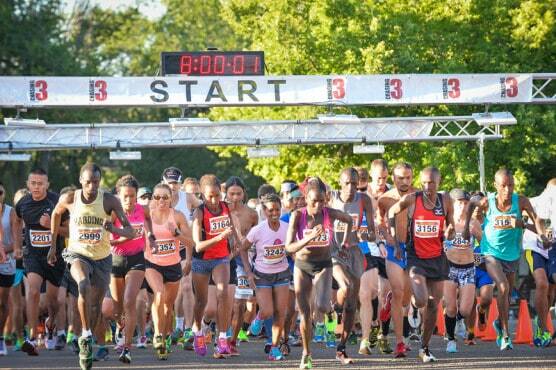 Also, please note that this year’s race will start at 7:30 AM!